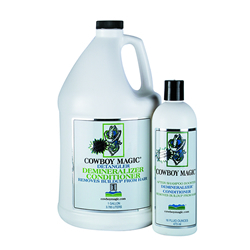 Cowboy Magic Rosewater Conditioner is a new innovation in the equine market. Hair neutralization and clarification has been a human hair salon service for a long time. Furthermore, it results in healthy looking hair. It deep conditions: Silk and panthenol penetrate hair and skin, hence, moisturizing and adding body to hair. It is long lasting: Neutralizing the hair by demineralizing, it can last for more than a week depending on the water you use and what other treatments are put on the hair after neutralization. Whatever additional process you use, hair will look and feel better. It neutralizes static electricity, therefore, tangles are reduced and kept to a minimum as static electricity is controlled by reducing the trace mineral in the hair. 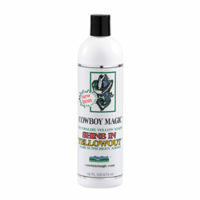 Only takes a small amount: The formula is very concentrated and a small amount goes a long way. It works on people too: Human hair care salons have been offering this special service for a long time. 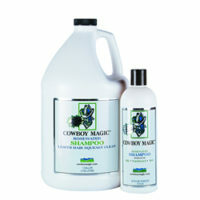 In addition, you can use COWBOY MAGIC as a conditioner and body builder after shampooing. 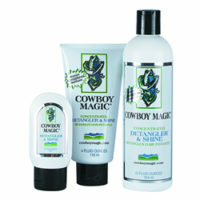 As a result, hair will instantly look and feel soft and clean with full body and be more manageable.